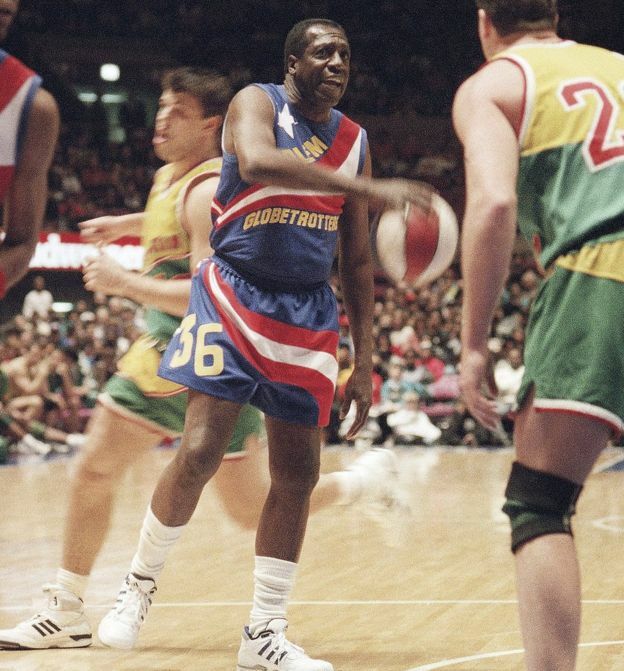 As I’m sure you all know by now, Meadowlark Lemon passed away earlier this week, which makes this a good time to look at the rich topic of Harlem Globetrotters uniforms. I was growing up on Long Island in the 1970s, when the Globetrotters were particularly popular. They had a Saturday-morning cartoon show (yes, I watched) and were frequently shown on ABC’s Wide World of Sports. I saw them twice during this period, both times at the Nassau Coliseum. Lemon and Curly Neal were the top ’Trotters in those days, and to many of us they will always represent the “real” ’Trotters, even though the team actually dates back to the 1920s. Similarly, the uniforms from the Lemon/Neal period, as modeled above by Lemon in a Burger King ad, will always be what I think of as the “real” Globetrotters uniforms — the blue jersey with the vertically arched “Harlem” and the four stars, the candy-striped shorts, the striped tube socks. 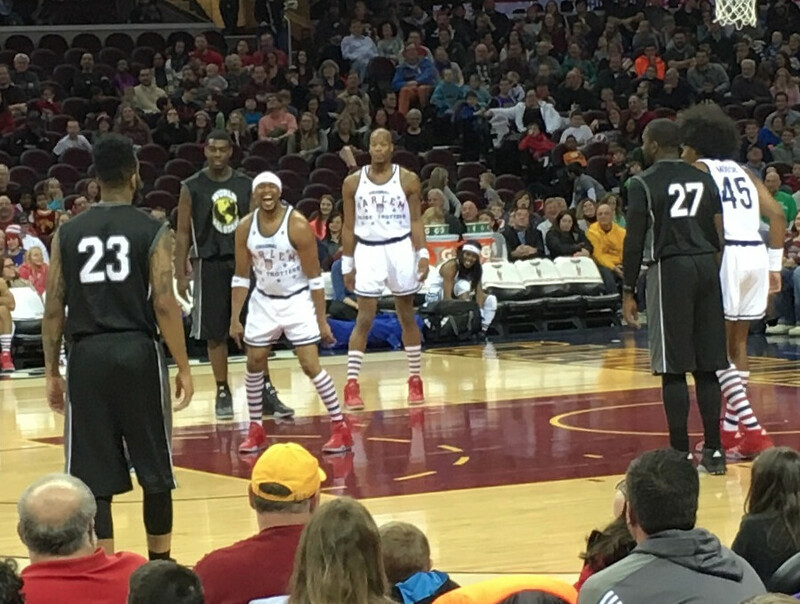 That throwback was created to mark the Globetrotters’ 90th anniversary. It will be worn for the first half of all their games in 2016, with the team switching to their regular uniforms for the second half. I’ll have more info on this in an ESPN piece next week. Leafs/ESPN reminder: In case you missed it yesterday, the results of my Maple Leafs redesign contest are in. Get the full scoop here. Raffle update: All of the year-end raffle prizes have now shipped out. So if you were one of the winners, watch yer mailbox. 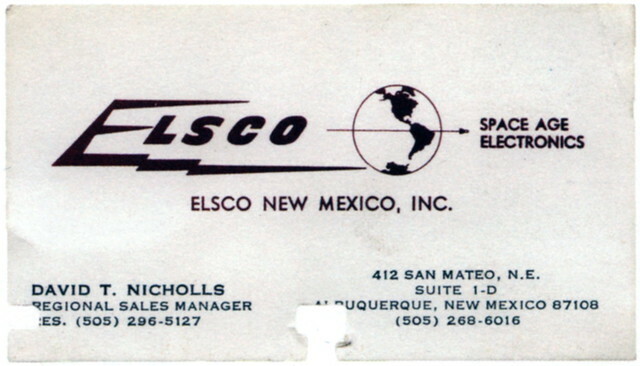 PermaRec update: The business card shown above was salvaged from a decades-old Rolodex used at Los Alamos National Laboratory, where the atomic bomb was developed. It’s one of 150 very cool-looking old Rolodex cards featured in a sensational new book. Get the full story over on Permanent Record. Gromm•It update: Grommets in nuts? That’s nuts! More photos over on Gromm•It. NFL News: Multiple readers sent this in, but Nolan Jones was first: Bengals QB AJ McCarron wore a Nike sleeve and an Under Armour glove on Monday Night. … Poorly maintained fields, and the new prevalence of fields using synthetic turf, may contribute to the rise in concussions. … An Eagles player in the late 1970s/early 1980s had a seriously rugged facemask. ”¦ According to a new book by an anonymous NFL lineman, players routinely urinate in their pants during games as a macho gesture of commitment (from Tommy Turner). Hockey News: In 1971, the Jersey Devils of the Eastern Hockey League (EHL) held a “Uniform Night” where spectators wearing a uniform of any sort were admitted for a discount. Very blue collar. … The Los Angeles Kings’ online shop is mistakenly (I assume) selling a Sacramento Kings wristband (from Chris Bisbee). … Goalie Ben Scrivens was recently traded from Edmonton to Montreal. In his first game with the Canadiens last night, he apparently wore some of his Oilers equipment. “Looks like Scrivens did a decent job of changing the orange to red,” says Mike Engle. “Going from Edmonton to Montreal, the blue is shared and the iconography is still there (oil drop), but not as much clashing as there could have been. Note that the stick still has orange though. Also, his pads are inscribed ‘The Professor. '” … Good looks here at the Lake Erie Monsters Cavaliers-themed alts. … Wild RW Nino Niederreiter wore a hoodie underneath his jersey during an outdoor practice. NBA News: The Knicks wore their 1950s throwbacks last night. … The other night against the Spurs, T-Wolves F Andrew Wiggins lost his shoe on defense, so teammate Karl-Anthony Towns picked it up and held it during the rest of the possession. … Wizards owner Ted Leonsis owns a cool Bullets bucket hat (from Andrew Hoenig). … Raptors G Kyle Lowry was on NBA analyst Zach Lowe’s podcast yesterday, and he and Lowe talked about the Raptors’ new uniforms (about 35 minutes in). Not sure if we knew this, but Lowry says that he and teammate DeMar DeRozan had input on the new colors and uniforms this offseason. The team’s original plan was to switch to an entirely black-and-gold color scheme (not just for one of the alternates), but DeRozan convinced team officials to keep red and white. … The Hornets unveiled the name, colors, and logo of their new D-League team, the Greensboro Swarm (from Alan Filipczak). 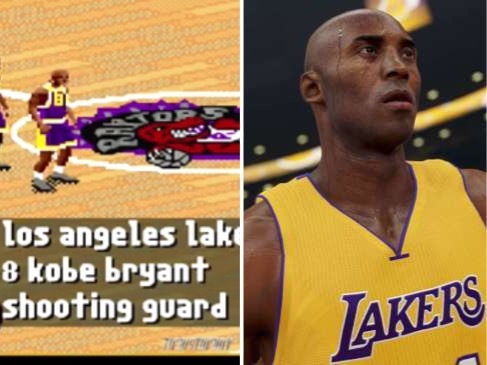 … This image comparing video game graphics between Kobe Bryant’s rookie season (1996-97) and this season made the rounds on Reddit yesterday. Grab Bag: The English soccer club Leicester has a Northwestern-striped mow pattern on its pitch (from Paul Kennedy). … A new anti-concussion collar draws inspiration from woodpeckers, an animal that can certainly withstand rapid and constant violent head movements (from Alex Sinclair). … New logo for the Verizon IndyCar Series. … David Firestone ranked all of the NASCAR Sprint Cup paint schemes. … Here’s a breakdown of which athletic shoe brands were the most popular on Instagram this year (from Mike Weston). … More year-end logo round-ups, with rankings of the best and worst corporate logo changes of 2015. And here are the unis the Globetrotters wore in the cartoon. 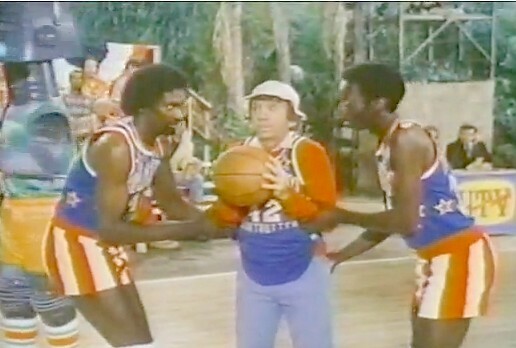 I remember seeing the Globetrotters and Meadowlark when I was a kid in the 70s, at the Richfield Colosseum. I must have been about 7, so the memories are a bit fuzzy. LOVE the socks on the 2016 first half HG throwbacks. Would love to pick up a pair or two of those! The Globetrotters were a “Must See” back in the 70’s. Back when there wasn’t the (over)saturation of sports, etc. on TV. Good clean fun (just ask the referee!). Motion to make those Knicks throwbacks the primary uni. by giving them a design that looked like it was rejected by your team and a name that sounds like it belongs in the WNBA? 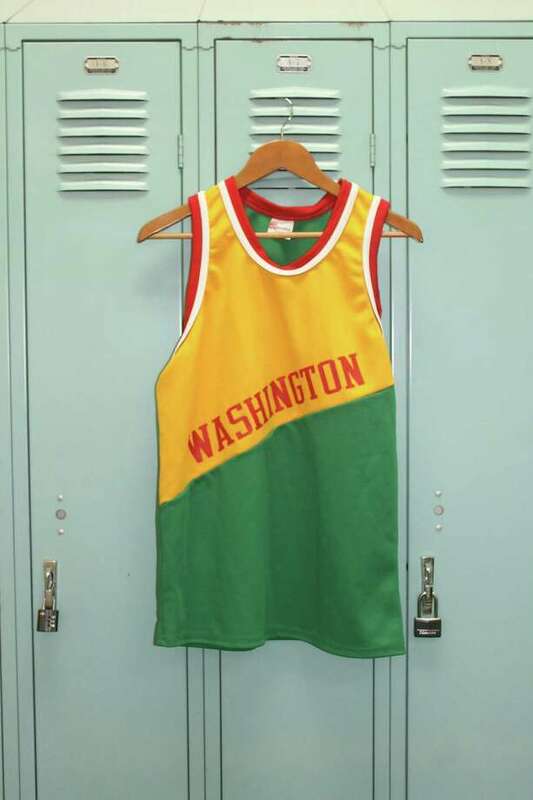 I would be interested in seeing how those Washington Generals uniforms have progressed too. Didn’t they retire/disband the Generals a couple years ago? Actually I believe it was just this year they folded up. What amazed me was I always thought the Generals were merely a bogus team owned by the Globetrotters to beat on, but from what I’ve heard that was wrong, they were actually their own organization. Wild. Correct. The Generals were decomissioned in April. RIP Meadowlark, and RIP Generals. It’ll never be the same without the two of you. One thing I didn’t know was that in the 1971-1972 season the team alternated between the Boston Shamrocks, New Jersey Reds, Baltimore Rockets and Atlantic City Seagulls. Same players, but different uniforms. It was while wearing the New Jersey Reds unis they beat the Globetrotters. Aha, that finally explains a memory I have of going to the arena to buy tickets (somewhere during that time) with my Dad (I was about 9) and being excited because I thought that the Celtics were playing the Globetrotters. During their 2012 Cup run, the LA media routinely replaced the LA Kings logo (and mascot) with the Sacramento Kings logo (and mascot). It became so frequent it felt like a running joke. Maybe this is a nod to the whole wacky thing. When the Kings were rumored to become the Anaheim Royals, I was looking forward to their rebrand. The overlap between the NBA Kings and NHL Kings makes me uncomfortable. So now I recognize that one set of stirrups on your mantelpiece that I thought at first was the St. Louis Blues. First off, I love the vertical arching of “Harlem”, elegant and detailed. But the script “Harlem” is a revelation. And while the saturation of blingy teams might have a numbing effect before long, I wish more uniforms borrowed from the Globetrotters. Great nickname too; rakish, without punking the American Indians. The word “Ridiculous” doesn’t do justice when describing the Texas A&M unis. C’Mon Man! Those unis might be the real reason two of their quarterbacks transferred. Wow. This takes me back. Like Paul, I too saw the GTs at the Coliseum in the 70s as a kid, and that of course included Meadowlark and Curly et al. Wonder if we were at the same set of games? Didn’t watch the tv show, but was more than familiar with them. And I also have a pair of GT stirrups. Saw them one last time in the late 90s with my then-wife, at the Coliseum (we took her dad for his b-day), and they were not quite as I remembered. Sure the bucket of water/paper trick was still in play, as were the ball tricks, but it wasn’t what I had remembered as a kid. What struck me the last time (though it certainly could have happened in the 70s as well), was for about 2/3rds of the “game” the GT’s clowned around and did tricks and such; the remaining 1/3 was actually straight basketball, and the team (not the Generals for some reason) held their own, but of course the Trotters had such a huge lead they weren’t going to be caught. With about 5 minutes left, the trick play resumed and of course, the GTs won. I was surprised they didn’t play fake hoops for the whole game. My pop would tell me stories of the early ‘trotters actually playing straight hoops against some NBA teams and coming close to winning or winning, that’s how good they were. Thanks for today’s lede, PL — brings me back! 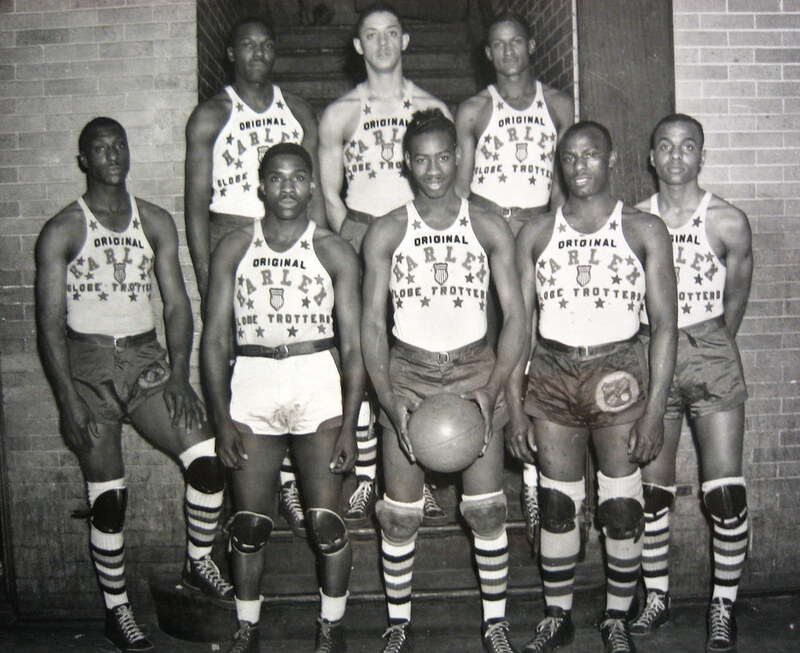 The Globetrotters defeated the George Mikan-led Minneapolis Lakers on a buzzer-beater in 1948. They were the real deal at that time – and were for several more years before the NBA’s integration turned them into an entertainment vehicle. I was always a fan of the Lynn Dickey mask as it seemed hardly anyone wore it. I didn’t like Dickey’s facemask, and didn’t like Ken Stabler’s either. #85 for the Eagles was actually WR Charlie Smith, who did suffer a broken jaw before the Super Bowl. His protective facemask was quite a work of art. I’ve always wondered who fashioned it as it seems to be the work of several facemasks welded together. This is a blooper clip somewhere of him trying to do an interview during Super Bowl week with his jaw wired shut. I saw this realtime and couldn’t quite believe it until Deadspin confirmed: ESPN graphic goof “promotes” UNI to playing in a FBS bowl. The picture of Meadowlark (RIP) illustrates very well in my opinion that a ‘busy’ uniform can also be great looking. Props to whoever designed it, well done. That other one, according to this website calls it a 1994, but in the description it was game worn in 1993. Apparently that photo of Meadowlark (RIP) was from a game on Feb.13,1993, at New York’s Madison Square Garden. — Taken from the description of that same site. I noticed the Jersey Devils played in the Cherry Hill Arena, which was possibly the worst arena to ever host professional hockey (in the WHA). No showers in the visitors dressing room so they had to get dressed in the hotel, and it apparently had a rather pronounced slope to the ice. Tell you what, both uniforms on that ’93 photo of Meadowlark get an I’d Wear That award. And I normally don’t give those out to uniforms from that decade. Here’s another look at the Generals jersey. Same reason there are multiple Ringling Bros. circuses — maximum touring exposure. When I was a little kid I thought the Globetrotters were so good that they couldn’t play in the NBA. In 1977 I saw them when they came to the Capital Centre in Maryland. I was sitting in the front row on the floor, when they did the water in the bucket routine a kid sitting two seats to my left got the bucket of shredded paper in the face, just a fun time. Thanks Meadowlark. With respect to the footballer, Mark Schlereth talked about how nasty linemen could be, like urinating while out in the field, or playing to the point of vomiting, like McNabb in the big game. He said many players did this, because, what, you’re going to run off the field for a bathroom break? He also felt God preordained and bestowed favor upon the team Mr. Schlereth was currently playing for; I believe he was interviewed on this prior to the SB with Green Bay in ’97. Video on Mark Schlereth, toward the end he talks about relieving himself.